Black Sable Ox Hair Stroke brushes are produced with ox hair and a seamless ferrule on a lacquered, easy-to-grip handle. Ox hair is the stiffest of the natural soft hair fibers and is ideal for applications requiring more precision and control. We have five standard brush offerings available in five different sizes and diameters, each with 7.5" overall length. These brushes come in a standard pack of 12 units. Ox hair brushes are extremely versatile and are effective in many different industrial and utility applications. 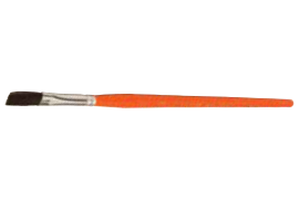 Great craftsmanship and high quality materials extend the life of these brushes.